This week we have a wonderful sketch challenge from Create with Connie and Mary. 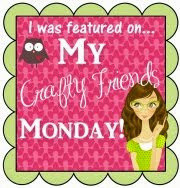 I just had to use a few of my pre-ordered goodies from the new Stampin' Up! Catalog for the sketch, plus a favorite current set, By the Seashore. Isn't this new Lost Lagoon (the deeper aqua green) pretty! It works perfectly with SU's Soft Sky color and the Hello Honey is very complimentary! The papers in the background are from the new Moonlight DSP Stack. The large dotted design also has Basic Gray in it, and that's what color the stamping is done in also. 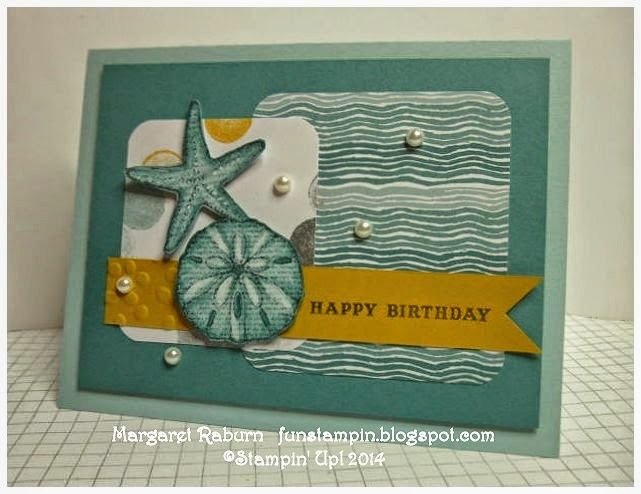 I stamped the sand dollar and starfish onto Soft Sky cardstock then added some Lost Lagoon color with a Blender Pen. I lightly used the White Chalk Marker to give some highlights and adhered them with Dimensionals. I thought Pearls would look just right for this sea-themed card too! Be sure to check out the cards by the other members of the Challenge Design Team then we hope you will take the challenge yourself to make a card using this sketch! 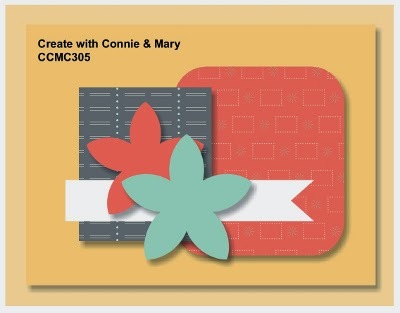 All the guidelines are on the same post as the Design Team's cards here: Create with Connie and Mary. Be sure to post your creation somewhere online then upload it to the CWCM website link! We'd love to see what you do with it! Thanks for visiting today!! Stamp on! Margaret, your card is beautiful. I love anything to do with the ocean/beach! Love how you incorporated the paper and I never thought of it but yes, pearls are a perfect embellishment for a sea theme. What a beautiful beach card! Love these colors together!! And your coloring of the shells is gorgeous! 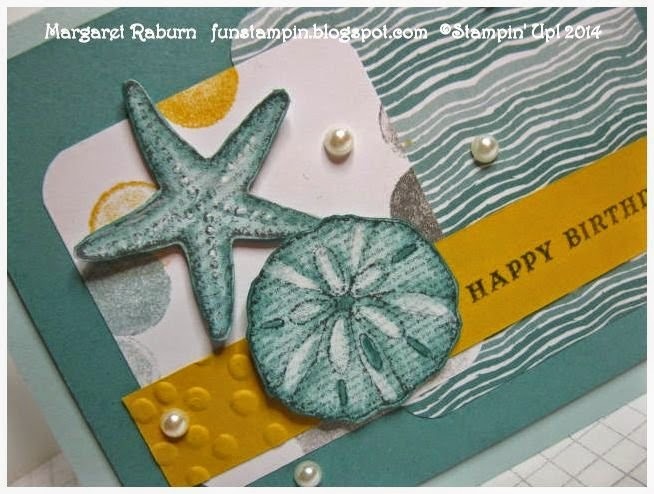 LOVE your sea theme card!!! Really makes me want that set now...goes with the DSP and colors beautifully! 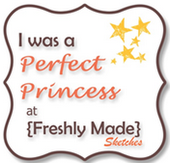 Great job with the sketch challenge this week! What a beautiful card!! Lost Lagoon is just perfect for a beach card. Awesome job with the sketch, you really nailed it! I love this card Margaret. Right up my alley in Maine! The colors look wonderful together! Beautiful use of this great new DSP and colors. Your sea themed card is just beautiful!!! Great colors too! The sand dollar and starfish are so realistic - love what you did with the chalk marker! 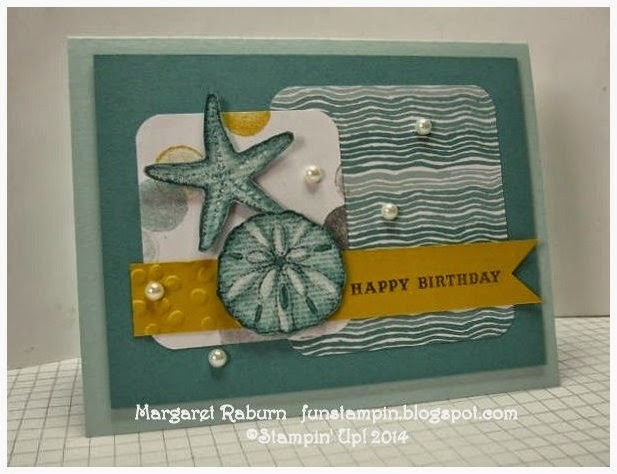 I love how you used the beach theme and shell stamps with these colours - just gorgeous Margaret. Please accept my apologies for being a week late! I love these colors for a beach themed card! They look fabulous! I really love the way you highlighted the starfish and sand dollar with the blender pen and chalk marker! Very cool! And the pearls...well, they are perfect! 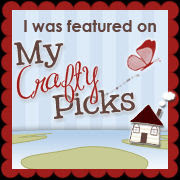 I'm an avid stamper and paper crafter celebrating my 12th year as a Stampin' Up!© Demonstrator! Any Stampin' Up! products may be purchased online 24/7 through my Stampin' Up! Demo Website. Your order ships directly to you! Click on the "comments" link at the bottom of any post to leave your comment or question about that project. Thanks! Online Ordering for SU Products; delivered directly to you from Stampin' Up! STAMPIN' UP! Home, Blog, Catalogs and current specials & promotions! Envelope Punch Board "Spool" Card! WEEKLY DEALS - May 13 - 19 only! MAY 6 WEEKLY DEALS from Stampin' Up! Monday Road Trip for Catalog Premiere! All content including text, photographs, and design is © Margaret Raburn. Original artwork is shared for personal inspiration only and may not be copied for contest submission or publication. Thanks!